Regular engagement in vigorous physical activity has been associated with reduced mortality in middle age and in later life.1 ,2 Active older people consume less health resources than their inactive counterparts,3 possibly because physical activity reduces the morbidity associated with diabetes, musculoskeletal disorders, cardiovascular diseases and cancer,4 as well as the risk of frailty.5 ,6 These findings suggest that a physically active lifestyle contributes to increase longevity and, potentially, ageing free of significant medical morbidity. Such outcomes are akin to the concept of successful or healthy ageing. A sufficiently powered randomised controlled trial would be the best way to establish with certainty that physical activity causes older people to age successfully. Although there is trial evidence to prove that physical activity improves physical and mental function, such data have arisen predominantly from at-risk populations (such as sedentary people or older adults with mild cognitive impairment or depression) and are difficult to generalise.9 ,12 ,14 Designing a trial of physical activity for an unselected community sample of older people would be challenging because of the high probability of contamination of the control group and loss of power. A longitudinal study of a community-representative sample of older people might be a more pragmatic way of ascertaining whether physical activity contributes to healthy ageing. Such a study should aim to minimise confounding (eg, age, education and body mass index), reverse-causality (eg, prevalent disease causing physical inactivity) and survivorship bias (eg, outcome data more likely to be available among those who are healthy) to ensure that its results are valid. We examined the association between physical activity and healthy ageing in a community-representative sample of 12 201 older men. We collected survey data at two different time-points and used electronic administrative health records to optimise the validity of our analyses. We hypothesised that, compared with inactive men, participants who were physically active at the beginning of the follow-up period would have greater chance of being alive and free of affective, cognitive and physical functional impairment 10–13 years later. Cohort study of a community-representative sample of older men living in the Perth metropolitan area, Australia. We used the electoral roll to recruit a community-representative sample of 12 203 men aged 65–83 years into a study of abdominal aortic aneurysm, which served as the starting point for the Health In Men Study (HIMS). Details about the recruitment procedure have been described elsewhere.15 Eligibility for the current study required availability of physical activity data at the baseline assessment, which led to the exclusion of two participants and resulted in a study sample of 12 201 men. The study was conducted in accordance with the principles expressed by the Declaration of Helsinki for Human Rights. The Human Research Ethics Committee of the University of Western Australia approved the study protocol and all men provided written informed consent to participate. We also measured smoking status and alcohol use,18 and considered men who had never smoked or had quit smoking for at least 5 years ‘non-smokers for at least 5 years’. We chose this timeline because currently available evidence suggests that the health hazards associated with smoking require about 5 years of cessation to become apparent.19 Men who consumed less than four drinks per day in a usual week were considered ‘safe alcohol users’.20 We used standard procedures to measure participant's height (to 0.5 cm) and weight (to 0.2 kg), and calculated the body mass index (BMI) in kg/m2. BMI between 18.5 and 24.9 was considered normal. Finally, we asked participants the following question: Have you ever been told by a doctor that you had hypertension, diabetes, heart attack/angina/heart bypass surgery or angioplasty (coronary heart disease) or a stroke? (yes/no for each question). Outcome data were collected 9.8–12.6 years after the baseline assessment (mean±SD: 11.1±0.6). All cause mortality data were retrieved from the Western Australia Data Linkage System,21 which include information about the date of death that we then used to calculate time to death. We considered that surviving participants were ‘healthy’ if they showed no evidence of clinically significant symptoms of depression, impaired cognition or daily physical function at the follow-up assessment that was conducted in 2008–2009 (HIMS2). Men were considered free of clinically significant depressive symptoms if their total score on the Patient Health Questionnaire (PHQ-9) was lower than 10.22 The presence of cognitive impairment was established by a score of 27 or lower on the Telephone Interview for Cognitive Status.23 ,24 Men rated their functional limitations in grooming, eating normal food, bathing or taking a shower, dressing upper body, dressing lower body, getting up from a chair, walking inside the house and using the toilet (basic activities of daily living (ADL)),25 as well as shopping for personal items or groceries, doing light housework (eg, washing dishes and dusting), doing heavy housework, laundry, managing money, preparing main meals, taking medications, using the telephone and doing leisure activities or hobbies (instrumental activities of daily living (IADL)).26 Possible answers for each question were as follows: no difficulty, some difficulty, major difficulty, unable to do without help. We considered that men who indicated having ‘major difficulty’ or being ‘unable to do without help’ showed evidence of impaired function in the relevant area. For the purposes of this study, men who reported major difficulty or inability to perform any of the ADL tasks were considered to have impaired ADLs, and likewise for IADLs. A secondary endpoint of interest in this study was survival by 18 April 2009, which was the last date for the follow-up assessment, according to physical activity status at baseline (HIMS1). As changes in physical activity between baseline and the follow-up assessment could conceivably confound the results of the study, we repeated the assessment of physical activity at the follow-up assessment. We asked the following question: If you add up all the times you spent in each activity last week, how much time did you spend all together doing more vigorous leisure activity or household/garden chores that make you breathe harder or puff and pant? We considered that men were physically active if they reported 150 min or more of vigorous activity. Data were managed and analysed with the statistical package Stata release V. 12.1 (StataCorp, College Station, Texas, USA). We used descriptive statistics (mean, SD of the mean (SD) and proportions) to summarise our data, and t tests (for age) and Pearson χ2 statistics (χ2) to compare the characteristics of participants who were and were not physically active at the baseline assessment. We used Cox regression to estimate HR of death by 18 April 2009 according to physical activity status, and adjusted the results of the analyses for the effect of age, education, marital status, smoking, alcohol use, body mass index and the presence of hypertension, diabetes, coronary heart disease and history of stroke. The results were plotted using the Kaplan-Meyer survival function. Exponentiated log-linked general linear models were used to estimate the risk ratio (RR), and 95% CI of RR of depression, cognitive impairment and impaired IADLs and ADLs at follow-up according to whether men were physically active or not at the baseline assessment. We followed the same procedures to estimate the crude and adjusted RR of being ‘healthy’ at the follow-up assessment according to physical activity status at baseline, and adjusted the analyses for the same variables described above. Finally, we grouped participants according to their level of physical activity at the baseline and follow-up assessments: physically inactive at baseline and follow-up, physically inactive at baseline but active at follow-up, active at baseline but physically inactive at follow-up and active at both baseline and follow-up. We then estimated the RR (and 95% CI) of being ‘healthy’ at follow-up for each group. These analyses were adjusted for the same variables described above, as well as for the following follow-up variables: marital and smoking status, alcohol use and BMI group. The α was set at 5% and all statistical probability tests reported are two-tailed. Of the 12 201 men who entered the study, 2058 (16.9%) were physically active. Physical activity decreased with increasing age, and active men were on average 1.1 years younger than their non-active counterparts (71.2±4.1 vs 72.3±4.4; t=10.68 (df=12 199), p<0.001). Table 1 summarises the demographic, lifestyle and clinical characteristics of men at the baseline assessment. A larger proportion of physically active than inactive men reported the completion of high school education, non-risk alcohol use or smoking, and BMI in the normal range. They were also less likely to report a clinical history of hypertension, coronary heart disease and stroke. Eleven years later (mean: 11.1±0.6; range: 9.8–12.6) 4733 men had died, leaving a surviving sample of 7508 people. Of those, 3276 (43.6%) accepted our invitation to complete the follow-up assessment. Completion of the follow-up assessment was greater among men who were physically active than inactive at baseline (RR=1.18, 95%CI=1.08 to 1.30). Cox regression showed that active participants had lower hazard of death during follow-up (n=582/2058) than their physically inactive counterparts (n=4111/10 143): HR=0.74, 95% CI=0.68 to 0.81 (adjusted for age, marital status, education, smoking, alcohol use, body mass index and prevalent hypertension, diabetes, coronary heart disease and stroke; figure 1). Survival of participants according to whether they were physically active. Participants who reported being vigorously active had lower hazard of dying between the assessments than inactive men (n=582/2058 vs 4111/10 143; HR=0.74, 95% CI 0.68 to 0.81; the analysis was adjusted for age, marital status, education, smoking, alcohol use, body mass index and prevalent hypertension, diabetes, coronary heart disease and cerebrovascular disease). The adjusted risk ratio (RR) of physically active survivors completing the follow-up assessment compared with physically inactive survivors was 1.18 (95% CI 1.08 to 1.30). The RR of impaired cognitive function, IADL and ADL at the follow-up assessment was lower for active than inactive men (table 2), and was borderline non-significant for depression (p=0.053). The RR of reaching the follow-up assessment free of mood, cognitive and functional impairments was 1.21 among the survivors (95% CI=1.08 to 1.35; adjusted for age, marital status, education, smoking, alcohol use, body mass index and prevalent hypertension, diabetes, coronary heart disease and stroke). If we consider that those who died before the follow-up assessment could not be healthy, the adjusted RR of completing the follow-up assessment in good health was 1.35 (95% CI=1.19 to 1.53) for those who were active (n=259/1323) compared with those who were physically inactive (680/6646) at baseline. This last analysis excluded 4232 participants who were alive but did not complete the follow-up assessment. Finally, we grouped surviving men who took part in both assessments according to their level of self-reported physical activity. The results of these analyses are summarised in table 3. Being physically active in at least one of the assessments increased the RR of follow-up completion in good health (RR=1.38, 95%CI=1.24 to 1.54; adjusted for age, marital status, education, smoking, alcohol use, body mass index and prevalent hypertension, diabetes, coronary heart disease and stroke). The health benefits associated with physical activity were non-significant among those who were active at baseline but not at follow-up, increased by 35% among those who were physically inactive at baseline but active at follow-up, and was nearly 60% greater for those who reported being active at both assessments (table 3). The results of this community-based longitudinal study showed that a lifestyle that incorporates physical activity increases by 1.6-fold the chance of men aged 65–83 years remaining alive and free of functional or mental impairments after 10–13 years. We also found that the health benefits of physical activity appeared to be all but lost among active men who became inactive over the following decade, whereas men who were physically inactive and became active accrued the benefits of healthy ageing. Taken together, these results support the hypothesis that physical activity promotes healthy ageing. Before discussing the implications of these findings, we must consider the characteristics of the study that might have had an impact on the results. We used a random electoral roll list to recruit older men, voting being compulsory in Australia. The sample comprised 63% of all invitations, and previous studies have shown that those who took part were healthier than those who did not.27 Such a bias could have led to the selection of a more physically active sample, although the results of other community surveys are not consistent with such an interpretation: our men were not more physically active than other older people living in Western Australia.28 The assessment of physical activity is another factor that warrants consideration; it was based on the response of participants to a simple question designed to measure vigorous exertion that others have shown to have good face validity,29 which gives us confidence that our findings reflect the level of physical activity of older men in the community. Nonetheless, replication of our findings by other studies using a more detailed assessment of physical activity would strengthen our confidence in the validity and generalisability of the results. In addition, our definition of ‘physically active’ was limited to vigorous exertion, which could have contributed to misclassify as inactive men who engaged in sufficient amounts of moderate plus vigorous activity. In a previous study, we showed that self-reported non-vigorous physical activity was not associated with mental health outcomes,8 which suggested to us that a stringent self-reported measure of sufficient activity would be required. However, we acknowledge that a more detailed assessment of physical activity could have yielded useful information about a possible dose-effect for this association. Finally, we acknowledge that our definition of ‘physically active’ was not exactly the same at study entry and at follow-up. Notwithstanding this caveat, the stratification of the analyses for the assessment of risk allowed us to investigate both approaches to the definition of physical activity in a way that minimises bias. Loss to follow-up is an important source of bias in longitudinal studies. We had valid data on 12 201 men at study entry, of whom 4733 died and 44% of the survivors returned for a further assessment 10–13 years later. 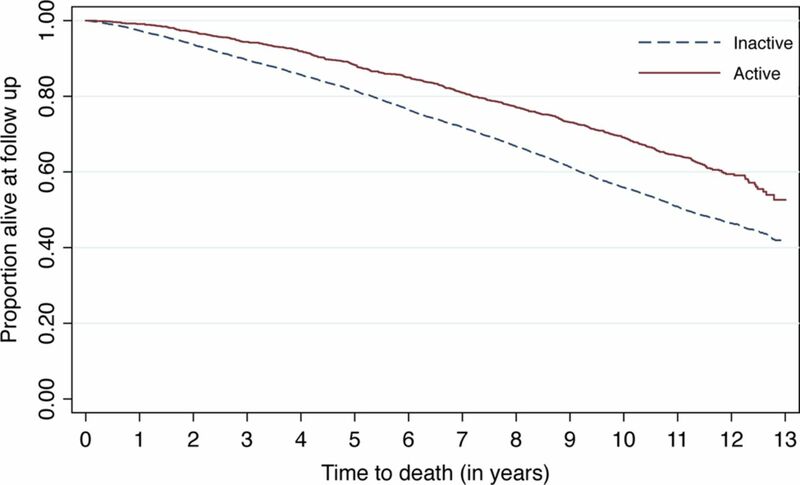 While survivorship bias is inevitable in a cohort study of older people, we were able to model both death and non-return as outcomes of the study, and showed that physically active men were more likely than their inactive counterparts to remain alive and return for assessment, demonstrating that physical activity makes a significant contribution to this critical aspect of healthy ageing: to be alive and engaged with one's environment. Our pragmatic definition of healthy ageing took into account the functional capacity of participants, as well as their cognitive and affective state.7 This strategy does not take into account important social variables, such as loneliness and financial stress, so that the proportion of men ageing successfully could be lower than that reported. The consequence of such a bias would be contamination of the sample of healthy ageing individuals, which most likely would have reduced the effect size of the associations with physical activity. Therefore, it is possible that the association between physical activity and healthy ageing could be even greater than that reported in this study. We carefully adjusted our analyses for known confounding measures, including demographic, lifestyle and clinical variables, such as prevalent diabetes, hypertension, coronary heart disease and stroke. Notwithstanding the merit of our approach to the analyses, the possibility of residual confounding by unmeasured prognostic factors cannot be entirely dismissed. It is possible that the association between physical activity and healthy ageing could also be due to reverse causality. In this case, people would be physically active because they are healthy. The prospective design of the study and the statistical adjustment for prevalent morbidities minimises this possibility, as does the evidence that people who were physically inactive at baseline but became active at follow-up increased their chance of healthy ageing. Indeed, the chance of healthy ageing was highest among those who were active at both assessments, which seems consistent with a causal effect of physical activity. Given that the association between physical activity and healthy ageing seems to be valid and physiologically plausible, the remaining challenge is to enhance physical activity participation among older people living in the community. Three broad areas should be considered. The first is the creation of environments that are conducive to safe and regular activity: older people have lower risk of depression if they live in more walkable neighbourhoods,42 particularly those that offer access to safe paths and green areas.43 The second is the education of those at risk through campaigns and the promotion of events that encourage physical activity, although the effectiveness of such approach has not been tested yet. Third, health professionals must be trained and equipped to implement opportunistic interventions of physical activity for those at risk, although these interventions are likely to affect only a selected group of older people, possibly the most frail in our community. In conclusion, physical activity increases 10-year to 13-year survival free of functional or mental impairment in later life. As communities worldwide experience a demographic transition towards older age, the number of people disabled by ill health will continue to increase.44 Our findings indicate that physical activity could play a key role in ensuring that we add healthy life and not only years to our ageing population. Men aged 65–83 years who are physically active (>150 min/week of vigorous physical activity) are more likely than their counterparts to live an additional 10–13 years. Older men who are physically active have greater chance than their counterparts of surviving 10–13 years free of cognitive and functional impairment, as well as of depression. Older men who were active and became inactive lost some of the health benefits associated with physical activity. Those who reported <150 min/week of vigorous physical activity and subsequently became active gained health benefits, whereas those who remained physically active benefited the most: 60% increased chance of healthy ageing. How might these results affect clinical practice in the near future? Health promotion messages should remind older adults that it is never too late to become active and to enjoy the health benefits associated with physical activity. Whenever feasible, clinicians should encourage physical activity to promote greater longevity and healthy ageing.
. Physical activity and all-cause mortality in older women and men. Br J Sports Med 2012;46:664–8.
. Domains of physical activity and all-cause mortality: systematic review and dose-response meta-analysis of cohort studies. Int J Epidemiol 2011;40:1382–400.
. Does physical activity reduce seniors’ need for healthcare? A study of 24 281 Canadians. Br J Sports Med 2010;44:902–4.
. Physical activity as a preventative factor for frailty: the health, aging, and body composition study. J Gerontol A Biol Sci Med Sci 2009;64:61–8.
. Exercise training and nutritional supplementation for physical frailty in very elderly people. N Engl J Med 1994;330:1769–75.
. Recent advances in research on successful or healthy aging. Curr Psychiatry Rep 2007;9:7–13.
. Successful mental health aging: results from a longitudinal study of older Australian men. Am J Geriatr Psychiatry 2006;14:27–35.
. Effects of a physical activity intervention on measures of physical performance: results of the lifestyle interventions and independence for Elders Pilot (LIFE-P) study. J Gerontol A Biol Sci Med Sci 2006;61:1157–65.
. Physical activity and maintaining physical function in older adults. Br J Sports Med 2009;43:28–31.
. Exercise and longevity. Maturitas 2012;73:312–17.
. Lifestyle predictors of healthy ageing in men. Maturitas 2013;75:113–17.
. Physical exercise and clinically depressed patients: a systematic review and meta-analysis. Neuropsychobiology 2013;67:61–8.
. Cohort profile: the Health In Men Study (HIMS). Int J Epidemiol 2009;38:48–52. National Heart Foundation and Australian Institute of Health and Welfare. Risk factor prevalence study—survey number 3, 1989. Canberra: NHF, 1991.
. CRP 1846G>A polymorphism increases risk of frailty. Maturitas 2012;71:261–6.
. Smoking cessation and the risk of stroke in middle-aged men. JAMA 1995;274:155–60. NHMRC. Australian Guidelines to reduce health risks from drinking alcohol. Australia: Commonwealth of Australia, 2009.
. A decade of data linkage in Western Australia: strategic design, applications and benefits of the WA data linkage system. Aust Health Rev 2008;32:766–77.
. Validity of the Telephone Interview for Cognitive Status (TICS) in post-stroke subjects. Int J Geriatr Psychiatry 2004;19:75–9.
. Validity of the telephone interview for cognitive status (TICS) and modified TICS (TICSm) for mild cognitive imparment (MCI) and dementia screening. Arch Gerontol Geriatr 2011;52:e26–30.
. Population based randomised controlled trial on impact of screening on mortality from abdominal aortic aneurysm. BMJ 2004;329:1259.
. The baby boomers and beyond report: physical activity levels of older Western Australians 2006. Perth, Western Australia: Western Australian Government, 2008.
. Why target sedentary adults in primary health care? Baseline results from the Waikato Heart, Health, and Activity Study. Prev Med 2003;37:342–8.
. Aerobic exercise and resting blood pressure in older adults: a meta-analytic review of randomized controlled trials. J Gerontol A Biol Sci Med Sci 2001;56:M298–303.
. Controlled aerobic exercise training reduces resting blood pressure in sedentary older adults. Blood Press, 2013.
. Exercise, lipids, and lipoproteins in older adults: a meta-analysis. Prev Cardiol 2005;8:206–14.
. Exercise-based cardiac rehabilitation for coronary heart disease. Cochrane Database Syst Rev 2011:CD001800.
. Physical activity and risk of cerebrovascular disease in the European Prospective Investigation into Cancer and Nutrition-Spain study. Stroke 2013;44:111–18.
. Physical activity and cancer prevention—data from epidemiologic studies. Med Sci Sports Exerc 2003;35:1823–7.
. Physical activity and risk of cognitive decline: a meta-analysis of prospective studies. J Intern Med 2011;269:107–17.
. Total daily physical activity and the risk of AD and cognitive decline in older adults. Neurology 2012;78:1323–9.
. Effect of exercise on depression severity in older people: systematic review and meta-analysis of randomised controlled trials. Br J Psychiatry 2012;201:180–5.
. Physical activity reduces the risk of subsequent depression for older adults. Am J Epidemiol 2002;156:328–34.
. Protective association between neighborhood walkability and depression in older men. J Am Geriatr Soc 2007;55:526–33.
. The urban built environment and mobility in older adults: a comprehensive review. J Aging Res 2011;2011:816106. Contributors OPA conceived and designed the experiments. OPA, GJH and LF performed the experiments. OPA analysed the data. OPA and KMK drafted the manuscript. All authors reviewed the manuscript for important intellectual content and approved its submission for publication. Funding National Health and Medical Research Council of Australia, project grant numbers 279408, 379600, 403963, 513823 and 634492. Ethics approval Human Research Ethics Committee, University of Western Australia.